I originally made this card with the Global Design project GDP034 challenge in mind but I didn't organise my posts very well! 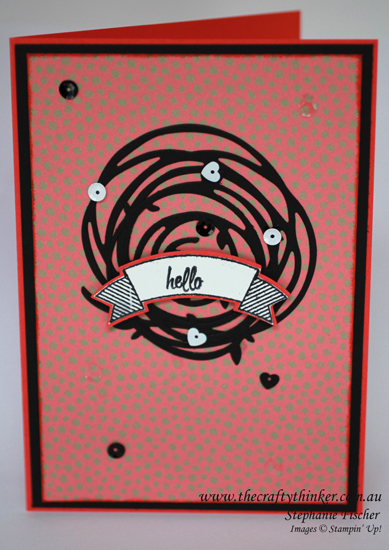 The card base is Calypso Coral layered with Basic Black and then some DSP from the new Affectionately Yours pack. The swirls are cut with the new Swirly Scribbles Thinlits. The banner is made with the new Thoughtful Banners Bundle which includes a punch and a stamp set with a very versatile set of banners and wording. I stamped with Basic Black onto Whisper White, punched out the banner and then trimmed around the black stamped edge before sticking it to another banner punched out of Calypso Coral cardstock. I added some black, white and clear sequins from the Metallics Sequin Assortment with the Fine-Tip Glue Pen and it was finished very quickly! .... but not in time to include in the challenge!